Bio-Sanitizer disinfecting tablets are scientifically formulated to provide efficient and reliable disinfection of water or wastewater treatment system flows. Manufactured from pure calcium hypochlorite, Bio-Sanitizer tablets dissolve slowly and evenly, providing effective and economical bacteria killing power. Each tablet contains a minimum of 70% available chlorine to insure maximum effectiveness. 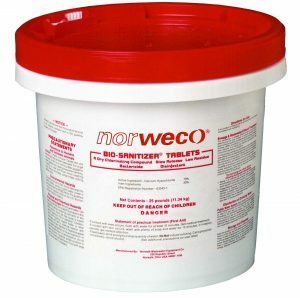 Bio-Sanitizer disinfecting tablets are a dependable, long-term source of chlorine that automatically adjust their chemical application to the rate of the flow. Bio-Sanitizer tablets are packaged in easy to open, resealable 10 lb., 25 lb., 45 lb. and 100 lb. Department of Transportation approved containers.